I've written before about the many ways in which my husband and I have different preferences. 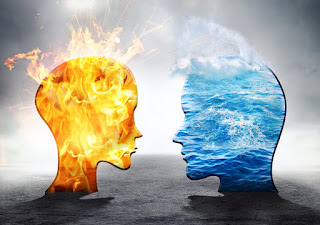 Often when people learn that Hubby and I have so many differences, they assume we must be constantly negotiating and compromising, or that we live in a state of constant discord. Nothing could be further from the truth. I'm not going to claim that we have never had an argument, or that there haven't been a few times when we had to make a choice that disappointed one of us. But those times have been rare. Most of the time, we don't even notice our differences, because these things aren't important. Think about it. You are who you are. Living with someone who uses a spoon where you would use a fork has nothing to do with you. If your partner likes green bananas and you prefer them overripe, it's easy enough to buy a few of each so you can eat what you want. If you constantly criticize your partner for choosing unappealing food, you won't change his taste, but you may make him feel belittled and resentful. If you feel personally insulted every time your partner folds a towel differently than you do, then you are going to have a hard time getting help around the house. I've known people like this, constantly aggrieved because they live with someone who just refuses to do things the "right" way. Marriages that started out as loving partnerships quickly become meaningless power struggles, as one or both people try to force each other to conform. When my husband eats something I wouldn't choose, I hope he enjoys it. When he folds the towels, I don't care how he did it. I'm just happy that the towels are folded. Rightly said and I completely agree with you. We should never try to change our partner or change ourselves for the relationship to work. Instead we should appreciate the differences and accept them. Youve given me something to think about. I know I get annoyed if my husband doesnt do certain things as I like them. But I see what you mean about folding the towels, I should try to just be glad he does something and not push so hard to do it my way. Yes, and I think our spouses will be more likely to do things for us if we show appreciation instead of trying to control them.